Use that extra leftover turkey to make the best keto leftover turkey casserole recipe. 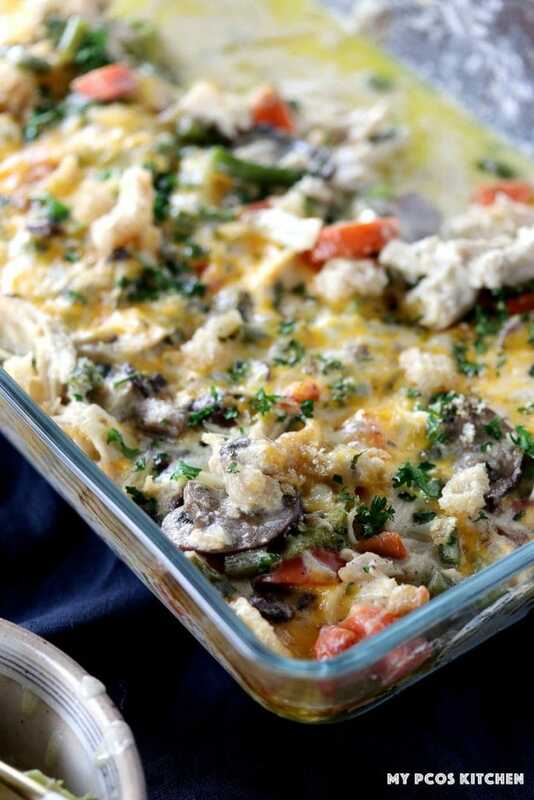 This creamy casserole recipe is filled with juicy turkey breast, vegetables, a keto white sauce and cheese. If you usually bake a turkey during the holiday season, you’ll surely have some turkey leftover meat. I baked a 14lb turkey this year earlier so that I could take additional pictures and videos, and I have so much turkey meat left. I live alone so making leftovers with my turkey was a must. Not only did I want to use a big part of my leftovers, but I also wanted to use the vegetables that I had in the fridge so making a low carb casserole was the perfect idea. 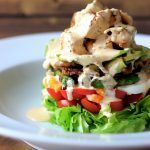 This easy turkey casserole recipe is filled with healthy vegetables and leftover turkey breast, coated in a keto white sauce and finally baked in the oven for a few minutes. 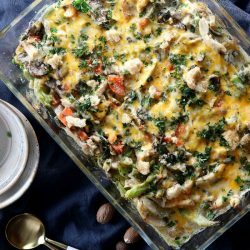 This keto turkey casserole kind of resembles a turkey pot pie casserole as the ingredients are pretty similar. 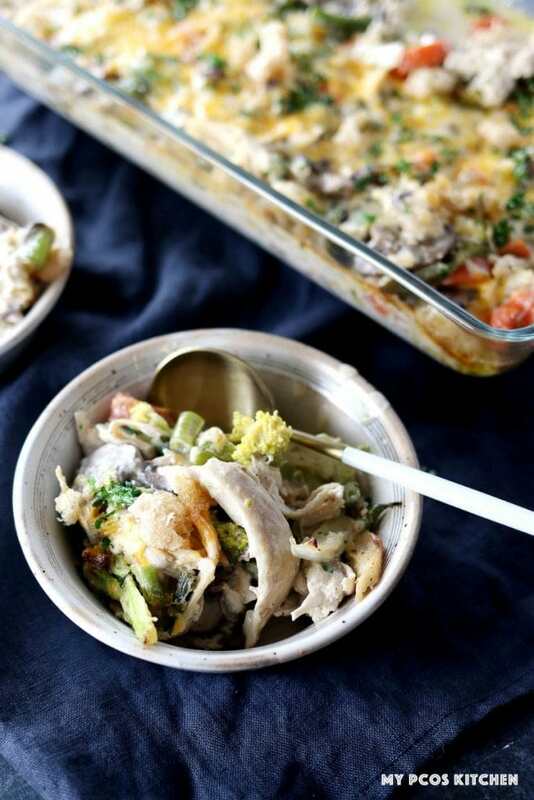 This keto leftover turkey casserole recipe is so simple as you only need to cook the vegetables and meat together in a large pot, coat it with the keto cheese sauce and bake it in the oven for a few minutes. A traditional white sauce is usually made with flour, butter and milk and it is used in a variety of dishes including lasagna, casseroles, or served over vegetables. 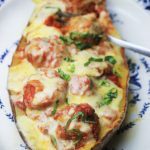 However, since it is not gluten free nor low carb, this keto white sauce uses keto friendly ingredients and is made with a combination of cream cheese, heavy cream, parmesan and different spices for flavour. The first thing you’ll want to do is melt your butter in a small pot. Once it’s melted you’ll want to add in the cream cheese. It’s easier for the cream cheese to melt if you cut it into cubes beforehand as adding an entire block of cream cheese will take longer to melt. Mix everything together. You’ll notice that the cream cheese and butter stay separated and don’t mix together. That’s normal. Once you add the heavy cream, they’ll blend in together without any problem. Add in the heavy cream and stir until everything has incorporated well together. Add in the spices and parmesan and continue whisking until everything has melted properly. You’ll then have a beautiful keto white sauce that can be used for any dish, but for this turkey casserole recipe, it’ll be poured on top. If you overheat your white sauce, the dairy and fat will separate and won’t stay together so in order to avoid that, make sure to cook everything on low-medium heat. Add your broken white sauce to a powerful blender, and mix everything for a good 20 seconds. The speed of the blender should put your white sauce together again. 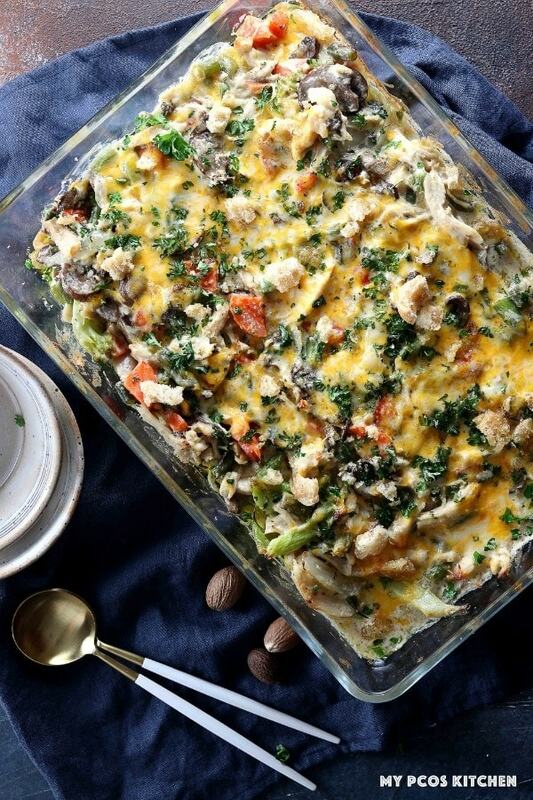 This keto turkey casserole is mostly made in a pot. The reason why is because the casserole contains green beans and carrots which take a long time to cook, so I prefer to cook them on the stovetop beforehand as the casserole doesn’t need to go in the oven for a long time. Once you’ve chopped all of your vegetables, you’ll want to cook them in a large pot with some butter. I added about 4 tbsp of butter and that was just enough to coat all of the vegetables and cook them properly until tender. Note, you can use olive oil, ghee, or avocado oil to cook the vegetables. Once your vegetables are all cooked, you can then add your shredded turkey breasts into the pot and mix everything together. Once all of your vegetables are cooked, you can then pour the keto cheese sauce all over and mix everything together. Pour the mixture into a casserole dish and top it with some cheddar, parsley and chopped pork rinds. Pop it in the oven for 10-15 minutes to melt the cheese and the creamy casserole recipe is ready to serve! Do I have to use turkey? I made this easy turkey casserole recipe because I had leftover turkey from my herb roasted turkey recipe. But if you don’t have any leftover turkey meat or you didn’t bake a turkey, you can definitely use leftover chicken. I don’t recommend using pork or beef for this recipe as chicken or turkey would taste much better. I also have another chicken casserole recipe where I used chicken with parsnips if you would prefer to use chicken instead of turkey. Do I have to use onions and carrots? No, this is entirely up to you. Since I eat around 50g of carbs per day, I try to take my carbs from vegetables, including onions and carrots. However, this dish itself doesn’t have that many carbs, less than 7g net carbs per serving. Do I have to bake this turkey casserole? The first half of the recipe is made on the stove top in a pot, but I put it in the oven at the end to melt the cheese on top and crisp up the pork rinds. If you would prefer to not use an oven, you could simply sprinkle some cheese over your casserole in the frying pan, cover with a lid for a few minutes until all of the cheese has melted. Also, baking the dish intensifies the flavours and the cream sauce gets creamier so if you can, I definitely recommend using the oven for the second half of the recipe. How many carbs does this casserole have? Since this low carb turkey casserole does contain onions and carrots, some of you may be worried about the carbs. The entire casserole has 54g of net carbs and each serving has 6.64g net carbs. There are actually more carbs in the heavy cream than there are in the carrots or onion. Most of the carbs come from the dairy and vegetables. Instead of turkey, you can use chicken. You can use any type of vegetable that you want. Carrots and onions are optional if you don’t feel comfortable using them. You can use any type of cheese you want. I used cheddar because that’s what I had on hand. 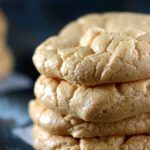 The crushed pork rinds on the top are completely optional. There only there to add some crunch, but you can skip them if you don’t need them. I prefer to cook the vegetables first in a pot so that they get tender enough. This way you don’t need to bake it long in the oven. You don’t need to bake it in the oven if you don’t want to. Simply add the grated cheddar over the dish in the pot, cover and let the cheese melt. 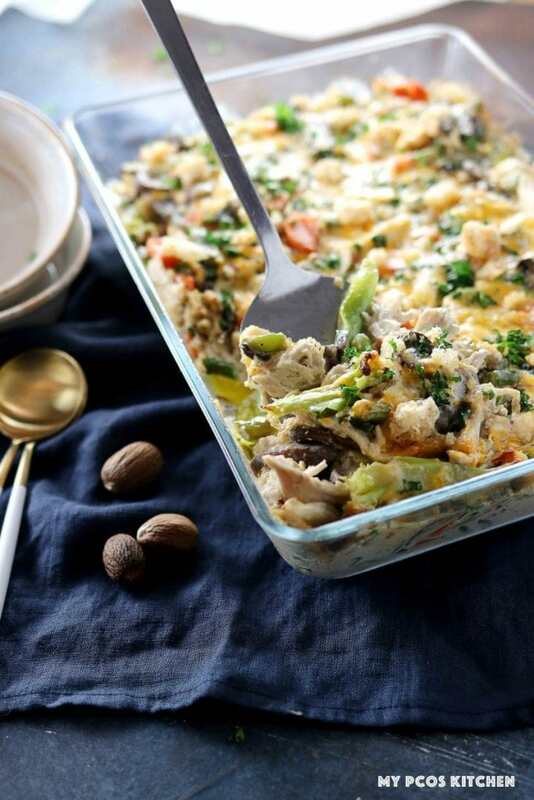 Use your leftover turkey or chicken to make a creamy casserole filled with delicious vegetables! Dice the carrot. Slice the onion, green beans, mushrooms and broccoli. Mince the garlic. Shred the turkey breasts. Grate the cheddar and parmesan. In a large pot, melt the 4 tbsp of butter. Add the onion, garlic and carrots. Cook 2-3 minutes and cover with a lid. Let steam for 2 minutes. Take the cover off and add the mushrooms and broccoli. Cook for another minute, cover and let steam for another 2 minutes. Add the shredded turkey breasts and mix everything together. Turn off the heat and set aside. In a small pot, melt the 2 tbsp of butter on medium heat. Add the cream cheese in. It's easier to melt if you separate the cream cheese into small cubes before putting it in the pot. Once the cream cheese starts to melt, start mixing it with a whisk. You'll notice that the butter and cream cheese do not mix together and are separated. That's okay. Add the heavy cream to the pot and continue mixing with your whisk. The oil and milk will now mix together without any problems. Add the salt, pepper and nutmeg, and mix together. Add the parmesan AND Heat the white sauce until it starts to bubble, for about 2-3 minutes. Turn off the heat and pour the white sauce all over the meat and vegetable mixture in the other pot that we set aside. Transfer the casserole ingredients into a casserole dish. Sprinkle the grated cheddar, chopped parsley and crushed pork rinds over everything. Bake for 15 minutes or until the cheese starts to become golden brown. Take out of the oven and serve! Stays good in the fridge for about 4-5 days. Made this for Christmas Day dinner and my husband and I loved it. Had to omit one ingredient, broccoli, due to it makes me so sick every time I ate it. The hubby took leftovers for work. Thank you for such a great recipe! Is there any way to make this DF? Dairy does not sit well with me by this looks so delicious!! Hi April, this is a really cheesy casserole so it wouldn’t be the same. 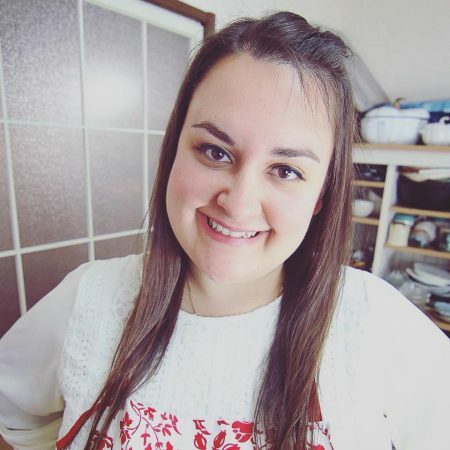 But I’ve seen some dairy free casseroles be made with coconut cream or almond milk and thickened with some tapioca or arrowroot and have nutritional yeast added, but it’s obviously not the same.